This entry was posted in Hens, Home paddock by Country lover. Bookmark the permalink. Aahh that’s lovely! I really miss my chickens, I gave up keeping them after about 15 years and numerous fox attacks. I loved seeing them in the garden, very decorative, like moving sculptures! Hi Cathy, thanks for this. Yes, everybody around me is losing chickens to the foxes. Up and until now, they have been free ranging in the garden, but now I’m retired I really want to get my garden back to how it was 10 years ago. The chickens make such a mess, digging up the beds and scratching stones onto the lawn, I’ve made this end of the paddock chicken safe i.e. with sheep wire, but not fox proof, which is next to impossible without electric netting. I think if I lose them to a fox I won’t replace them as the fox will just keep coming back. I could keep them in their run, which is 3m x 4m, for just four of them, but they ask me so to be set free. Sad, but it’s a fact of life unfortunately. Love this photograph! My chicken keeping days will start in about three weeks time! I am excited but wary about Mr Fox! Congrats on your retirement. Are you feeling happy to have retired now? Hi, thanks for popping by and good luck with the chicken keeping. I am worried letting them go out in the paddock as all my neighbours are losing their hens to the local foxes. They are safer in the garden, but they are destroying it. Now that I have the time, am trying to get it back to its former glory, so they are banned. Have had quite a busy week since I retired last week, with three full days away from the cottage, but from now on my time is my own and am looking forward to some serious gardening and getting back on my horse who’s been resting all winter, and spring! Yes, am so happy not to have to go to work, but it really hasn’t sunk in yet! hehe! 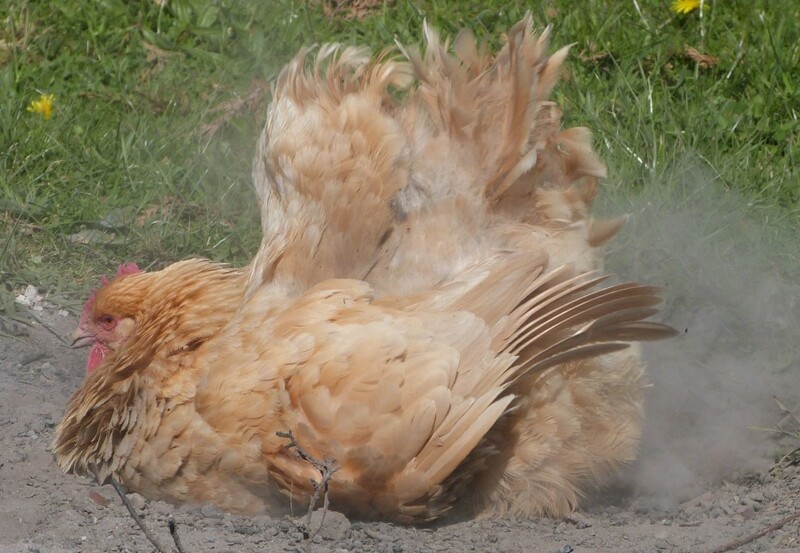 Great action shot – they do love dust baths don’t they?! We are down to 2 chucks but not because of foxes – just chicken poorliness! Yes, I have lost four hens for one reason or another. Sadly two out of my four haven’t laid for the past two years, but they don’t want to move on to make more room for two younger ones. Can’t bring myself to have them culled…. Oh that’s sad Angie. What does he have against them I wonder? Sadly mine won’t let me pick them up, so am not totally bonded with them! Ha ha. Thanks for the comment, much appreciated. What a great picture you have managed to capture! Hope your retirement is going well and you are finding plenty to keep you occupied! Thanks so much for your comment and thanks for your retirement wishes. I have a list of things to do (mostly jobs) as long as my arm. So much to do about the place, but I love having projects and getting things fixed and ship shape. Happy retirement – I’m sure you won’t be putting your feet up though. Thanks Fiona, you guessed right! Love having projects and physical work. Day was perfect for spraying the paddock, have far too many buttercups and other rubbish. Had purchased a super duper backpack sprayer that also had wheels. Went to do a ‘dry run’ with plain water (oer) to test it and the damn thing won’t work. It has a rechargeable battery to operate the pump to save you having to constantly pump it to pressurize it. But I couldn’t get it to work so am going to have to send it back. Shame, the weather has been perfect for it. Great action picture, our hens have dust baths under the kids trampoline, over the year they have dug some great holes to sink into. Yes, I love to watch them scratching up the dust under their wings. They really get quite frantic about it! Thanks for popping by. Adore this photo-reminds me of my Aunt’s house in Cyprus with chickens roaming around…just wonderful! Many thanks for stopping by. Wish we had Cyprus weather now it is really brrr here at the moment. Probably only 14 degrees but with a much higher windchill factor. What is going on with our weather I wonder. Hate it. Retired three weeks and hardly done anything in the garden yet! Am trying to ‘spring’ clean instead. Oh how I hate housework!